And Mary kept all these things, reflecting on them in her heart (Lk 2.19). I wanted to let you know that what you told me — how when you first start out as a nurse, you’ll have feelings of anxiety, knots in your stomach, tears, diarrhea…well, that is all true!!! It has been overwhelming, scary, awesome, and I was just wondering if you could pray for me. I have been battling doubt and feelings of inadequacy, and wondering if I can really do it! After reading that, you might be asking: Who in her right mind would want to be a nurse? Good question. Nursing taxes not only the mind, but the body and the soul as well. There are assessments to complete, meds to pass, labs to check, dressings to change, tubes to put in, tubes to pull out, bottoms to wipe, vomit to catch, and miscellaneous call-lights to answer. Then there’s charting. And more charting. And more charting. And more call-lights. And doctors to call. And more charting. And death and new life, pain and healing, tears and laughter. And more bottoms. 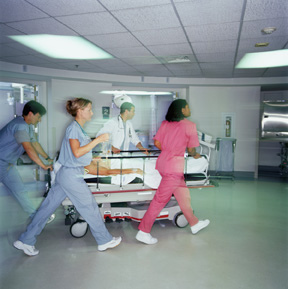 Plus, people expect nurses to be caring and patient and flexible regardless of circumstances. I mean, they’re nurses, for Pete’s sake. Isn’t that what they signed up for? Isn’t that what they were taught in nursing school? It is true that nurses tend to be a self-selecting lot. Despite the glamorized portrayals we see in the movies and on the tube, nursing students have a pretty good idea that they’re seeking admittance to a profession that’s all about stress and sacrifice and body fluids. It’s a life dedicated to service, and that’s exactly what future nurses are looking for. Nonetheless, those of us who teach nursing know that we can never adequately prepare our students for what lies ahead for them. There’s the daunting challenge of the profession itself, of course, but also a healthcare terrain that has become especially unpredictable. Technological innovations are introduced, incorporated, and junked at breakneck speed, while government policy and economics are infusing the delivery of care with volatility at every level. Still, we nursing educators do the best we can. And, apparently, we don’t do too badly, for nurses are still routinely rated as the most trusted professionals in the U.S. — ahead of physicians and pharmacists, college professors and clergy. But here’s the deal: Nursing school, like nursing, is not what you think. For some insight on this, consider the exquisite scene in the HBO version of Margaret Edson’s play Wit where Jason, a doctor and clinical fellow, and Susie, a nurse, have a conversation about sin and salvation, life and death. At one point, Susie asks Jas on what he believes about “the meaning-of-life stuff.” Jason, incredulous, responds with his own question: “What do they teach you at nursing school?” The doc — the scientist, the rationalist, the problem-fixer — can’t comprehend a healthcare colleague who’d really be interested in such trivialities. Meaning of life? What does that have to do with debulking tumors and optimizing renal function? Everything, I’d say. So would most nurses, even those with little or no faith. By its very nature, nursing pushes people together at vulnerable, fearsome moments. The encounter between patient and nurse breaks down barriers and peels away layers of emotional callus. We’re compelled to be transparent — naked, even. The soul is bared, we’re confronted with ultimate questions, our mortality is laid out before us, and we still have to get through the rest of the shift. So, nurses might seem like an odd lot, and thus Jason had a legitimate question: What do we teach in nursing school? Foolishly, recklessly even, I’d like to take a shot at answering him. If you’re a nurse or nursing student, what follows may sound familiar. Woody Allen famously declared that “Showing up is 80 percent of life.” That might be a tad high for my purposes — I prefer to say it’s more like 50% for nursing school. Our students hear the gospel of “keep showing up” from day one: Keep showing up, even after poor test grades, bad clinical days, foolish mistakes, glaring oversights, and gnawing self-doubt. When you wake up for clinicals at 4:30 in the morning, and the only thought that occurs to you is, “Why did I get into this?,” just get out of bed, put on your uniform, grab your stethoscope, and go. We can’t teach this, so in some respects it’s the most important thing a nursing student brings to nursing school. They have to keep showing up, despite failure, humiliation, disillusionment, and dread. Just keep showing up. No matter what. It’s half the battle. Pills — Like it or not, healthcare is largely driven by pharmaceuticals these days, and a large part of any nurse’s day is taken up by administering medications. Plumbing — This includes all body fluids (use your imagination), where they’re coming from, where they’re going, and keeping them all in balanced proportions. Pest Control — Keeping bugs at bay is a constant preoccupation for nurses, both in terms of preventative measures (like hand washing) and monitoring for signs and symptoms of infection. Our students learn to give shots and put in catheters. They can take vital signs and perform head-to-toe assessments. They therapeutically communicate and teach, monitor and intervene, save lives that can be saved, and provide comfort when they can’t. By and large, however, these are learned behaviors and psychomotor skills — pretty straightforward stuff. If you can learn to drive a car, you can learn to give an intramuscular injection or insert a nasogastric tube — no sweat. This is the easiest part of our job as nurse educators, but it constitutes only about a quarter of what nursing school is all about. The final 25% of what it’s about is much harder, because most nursing students instinctively reject it as a form of deception. 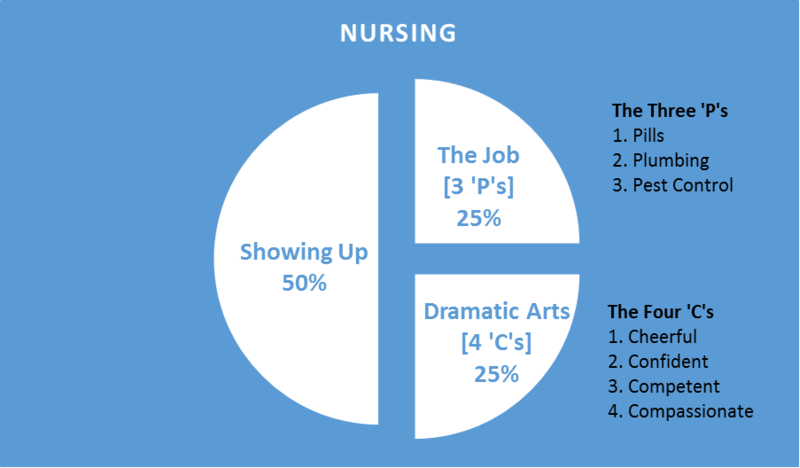 This is the acting dimension of nursing school — the part where you go in to give a real shot for the first time, and you have to act like it’s something you’ve done a million times before. It feels like lying to our students — especially the Christians — but it’s not. In fact, I’d say it’s even an act of love. Cheerfulness — Do nurses deal with problems in their personal lives? Do they have messy divorces, seriously sick kids, tight finances, car accidents, flooded basements, etc., etc.? Yes, and then some. Can they paste smiles on their faces when they clock in, and act like their only concerns are those of their patients? Yes, and we appreciate it when they do. Nursing students ought to do the same. Confidence — There’s a first time for everything. And a second and third. No matter how many times a student practices giving bed baths to manikins, there’s always that first time she has to bathe a total stranger. By acting confident when she may feel terrified, she helps put the patient at his ease. Next time, the terror will be less, and real confidence will expand. Competence — This is closely related to confidence, but with this difference: Confidence is purely subjective, while competence has an objective dimension, and it falls to nursing schools and nursing instructors to determine it. Yet, even when I can see that a student is competent to perform a skill — say, take a blood pressure, for example, or change a dressing — she can’t always see it. Instead, she’ll have to take my word for it, and project an air of competence for her patient’s sake, regardless of her feelings. Compassion — The toughest one to fake, for it’s the essence of nursing, right? But it’s a tall order to expect nursing novices to feel compassionate all the time. The demands of the work almost beat it out of you, and even the best nurses have to constantly — daily even — revisit and revive that enthusiasm for service which drove them into nursing school in the first place. Regular self-reflection and prayer, especially before clinicals, is a habit I urge all my students to adopt to avoid compassion fatigue and burnout later on. Yet, even then, there are moments when fabricated compassion is all we got, but it’s better than none at all. This last point — feigned compassion when real compassion is lacking — calls to mind a story by Max Beerbohm. It’s called The Happy Hypocrite, and it relates the tale of one Lord George Hell (! ), a licentious womanizer and hedonist who falls in love with Jenny, a virtuous lady. Jenny will have nothing to do with the worldly, debauched gentleman, so he makes his way to a mask maker, Mr. Aeneas, who agrees to supply Lord George with a new identity and character. And, behold! it was the mask of a saint who loves dearly. Lord George’s heart throbbed with pleasure. “And for how long does your lordship wish to wear it?” asked Mr. Aeneas. “I must wear it until I die,” replied Lord George. Lord George and Jenny are wed, and their new life together is filled with simplicity, peace, and bliss. All is right with the world until Lord George’s former lover, La Gambogi, shows up, accusing him of treachery and falsehood. She knows what kind of man hides behind the saintly disguise, and she demands that he remove it for Jenny to behold the truth. He refuses, but La Gambogi is not dissuaded. She calls him a “false saint,” and proceeds to violently unmask him herself. George stood motionless. La Gambogi stared up into his face, and her dark flush died swiftly away. For there, staring back at her, was the man she had unmasked, but, lo! his face was even as his mask had been. Line for line, feature for feature, it was the same. ‘Twas a saint’s face. And that’s what happens in nursing school, too! If our students keep showing up, and they keep doing the work, then little by little they become the cheerful, confident, competent, and compassionate nurses they only pretend to be when they’re starting out — amazing! Acting like nurses is the very thing that transforms them into real nurses. Needless to say, it’s not a process that ever ends, really. Even the most skilled, the most experienced nurses have moments of doubt and selfishness and pain that require conscious decisions to act contrary to inclinations. No matter. It becomes a learned behavior after a time, and soon it’s hard to distinguish between the acting and the reality — it all starts to blend together. It’s as if the struggle to live up to the ideal at some point becomes internalized, almost second-nature. And it’s at that point when nurses can be most like saints. ‘And when did we see thee a stranger and welcome thee, or naked and clothe thee? And when did we see thee sick or in prison and visit thee?’ And the King will answer them, ‘Truly, I say to you, as you did it to one of the least of these my brethren, you did it to me’ (Matt. 25:38-40). You know, maybe it’s not such a crazy job after all.